The first "Irish" postage stamps of Ireland, a brand new series of symbolic definitive postage stamps, appeared in 1923. These new definitive postage stamp designs would continue in use for 45 years, until they were replaced by a new definitive postage stamp series in 1968. The three paper watermarks shown above were used for the definitive postage stamps issued between 1923 and 1942. The Irish definitive stamps issued between 1923 and 1939 have WMK 044 for the Irish Free State. The Irish definitive stamps issued between 1940 and 1975 have WMK 262 for the Republic of Ireland. The overprinted Great Britain stamps from the 2 S. 6 P. denomination through the 10 S. denomination (the so-called "Seahorses") have WMK 034. 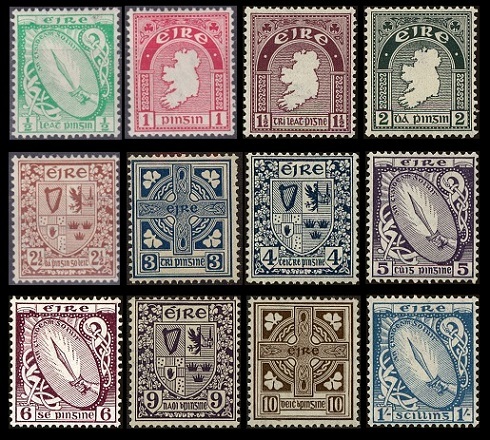 The twelve definitive postage stamps of Ireland shown above were issued between December 1922 and December 1923. The stamps are typographed on paper with WMK 044, and they are perforated 15 x 14. 00 1/2 P. (1923 - Sc. #65) - Emerald. 01 P. (1923 - Sc. #66) - Carmine Rose. 01 1/2 P. (1923 - Sc. #67) - Claret. 02 P. (1922 - Sc. #68) - Deep Green. 02 1/2 P. (1923 - Sc. #69) - Chocolate. 03 P. (1923 - Sc. #70) - Ultramarine. 04 P. (1923 - Sc. #71) - Slate. 05 P. (1923 - Sc. #72) - Deep Violet. 06 P. (1923 - Sc. #73) - Red Violet. 09 P. (1923 - Sc. #74) - Violet. 10 P. (1923 - Sc. #75) - Brown. 01 S. (1923 - Sc. #76) - Light Blue. The 1/2 P., 1 P., and 2 P. denominations were also issued in booklets. The booklet pane of the 1 P. with advertising labels (Sc. #66b) is shown at the top of this page. 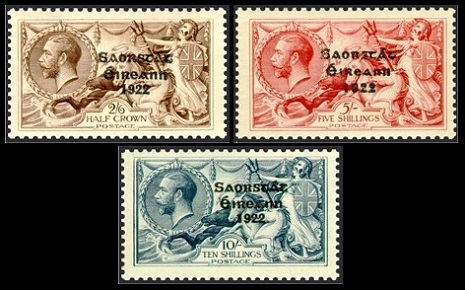 The three provisional overprint type stamps of Ireland shown above were issued between 1925 and 1928, as new high-denomination stamps of the Irish Free State were not yet available. The overprint means "Irish Free State". This group of stamps was overprinted in black or gray black by the Government Printing Office in Dublin and by the British Board of Inland Revenue at Somerset House in London. There are two different types of the overprint, differing in the width of "1922". 02 S. 06 P. (1925 - Sc. #77) - Gray Brown. 05 S. (1925 - Sc. #78) - Rose Red. 10 S. (1925 - Sc. #79) - Gray Blue. 02 S. 06 P. (1927 - Sc. #77b) - Gray Brown. 05 S. (1928 - Sc. #78b) - Rose Red. 10 S. (1928 - Sc. #79b) - Gray Blue. There are also pairs of these stamps, with one stamp having the narrow date and the other stamp having the wide date. The two horizontal coil format definitive stamps of Ireland shown above were issued in 1934. The stamps are printed on paper with a sideways WMK 044, and they are perforated 14 vertically. 00 1/2 P. (1934 - Sc. #91) - Green. 02 P. (1934 - Sc. #92) - Gray Green. 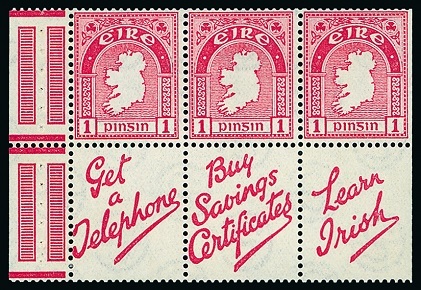 The three provisional overprint type stamps of Ireland shown above were issued in 1935, as new high-denomination stamps of the Irish Free State were not yet available. The overprint means "Irish Free State". This group of stamps was overprinted in black by Harrison & Sons. These stamps are from the Waterlow printing, which can be distinguished by the crossed lines in the background of the portrait. 02 S. 06 P. (1935 - Sc. #93) - Brown. 05 S. (1935 - Sc. #94) - Carmine. 10 S. (1935 - Sc. #95) - Dark Blue. 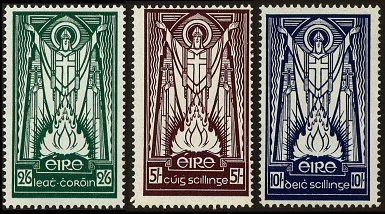 The three new high-denomination stamps of Ireland shown above were issued on September 8, 1937. The stamps are printed on paper with WMK 044, and they are perforated 14 x 15. 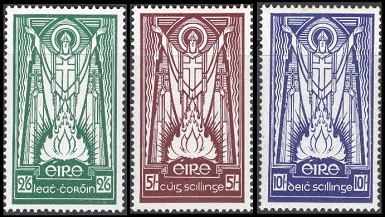 The common design of these stamps features an artistic depiction of St. Patrick and the Paschal Fire. 02 S. 06 P. (1937 - Sc. #96) - Bright Green. 05 S. (1937 - Sc. #97) - Brown Violet. 10 S. (1937 - Sc. #98) - Dark Blue. 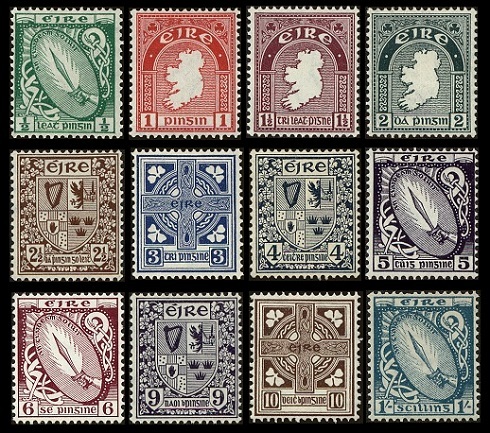 The twelve definitive postage stamps of Ireland shown above were issued between 1940 and 1942. The stamps are typographed on paper with WMK 262, and they are perforated 15 x 14. 00 1/2 P. (1941 - Sc. #106) - Emerald. 01 P. (1941 - Sc. #107) - Carmine Rose. 01 1/2 P. (1941 - Sc. #108) - Claret. 02 P. (1940 - Sc. #109) - Deep Green. 02 1/2 P. (1941 - Sc. #110) - Chocolate. 03 P. (1941 - Sc. #111) - Dull Blue. 04 P. (1940 - Sc. #112) - Slate. 05 P. (1940 - Sc. #113) - Deep Violet. 06 P. (1942 - Sc. #114) - Red Violet. 09 P. (1940 - Sc. #115) - Violet. 10 P. (1940 - Sc. #116) - Olive Brown. 01 S. (1940 - Sc. #117) - Blue. The 1/2 P., 1 P., 1 1/2 P., 2 P., 2 1/2 P., 3 P., and 4 P. denominations were also issued in booklets. The 1 P. denomination exists with booklet panes of six and booklet panes of three, with advertising labels. 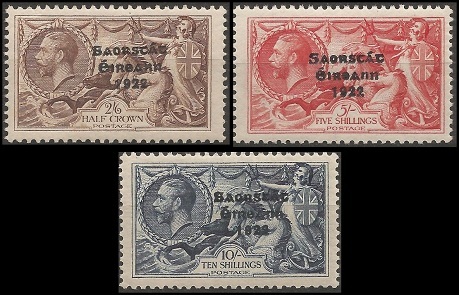 The three high-denomination stamps of Ireland shown above were issued between 1943 and 1945. The stamps are printed on paper with WMK 262, and they are perforated 14 x 15. 02 S. 06 P. (1943 - Sc. #121) - Bright Green. 05 S. (1943 - Sc. #122) - Brown Violet. 10 S. (1945 - Sc. #123) - Dark Blue. The vertical coil format definitive stamp of Ireland shown above (Sc. #87) was issued in 1933. The stamp is printed on paper with WMK 044, and it is perforated 15 horizontally. The vertical coil format definitive stamp of Ireland shown above (Sc. #105a) was issued in 1940. The stamp is printed on paper with WMK 262, and it is perforated 14 horizontally. The same coil format definitive stamp was re-issued in 1946, being perforated 15 horizontally (Sc. #105).